Many people ride public transportation and few have anything positive to say about it. Some people think fares are too high while others say the buses and metro lines are too crowded. Do you think you can do better? 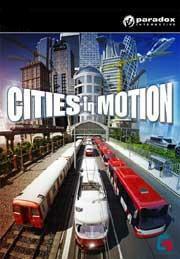 It’s time to put your money where your mouth is with Cities in Motion. When you start the game, you can choose to play through the tutorial, start a campaign, play a single scenario or play in the sandbox mode. I highly recommend going through the tutorial to learn the ropes. There are twelve missions in the campaign that you can play in order or individually in the scenario section. The campaign goes from 1920-2020 and you will revolutionize four different cities. (Vienna, Berlin, Amsterdam, and Helsinki) The sandbox area lets you do whatever you want with your limited starting funds. I didn\'t notice any goals or objectives in the short amount of time that I played it. That\'s probably the only difference than a scenario game is that it lets you choose the city, year, and difficulty and you\'re on your own from there. With all of the modes you can choose between three difficulty levels, easy, normal and hard. Some of the scenarios give you more starting cash than others. The personalities of the overseers vary in each situation. For example, one mission takes place during the recession and you get criticized for every penny you spend. On a different note, in the heiress of Helsinki mission you have to buy vehicles just because the heiress thinks they’re shiny and cool and will impress this guy she likes. Strong Points: Fun concept; easy to play and learn. Moral Warnings: Despite the E rating, there was some offensive slang. The game interface is pretty straight forward once you have it explained to you in the tutorial. (It would be pretty intimidating otherwise.) On the top left of the screen is a gauge letting you know how happy your customers are. To keep that in the green you have to have reasonable fares and waiting times. Your customers include students, drop outs, business people, blue collar workers, tourists and pensioners. The economy impacts how happy your customers are with the fares and how happy your employees are with their wages. You have to watch these numbers carefully to maintain a profit. On the bottom of the screen is a news ticker which notifies you of the economy status and it also lets you know if people love your service or are unhappy with the wait times. Bus routes are not only inexpensive, but they are also easy to set up. All you need to do is place a few bus signs, create a route, add a bus and you’re done! When you create a route, you have to close it with the first stop in order to complete it. While bus signs are adequate, there are fancier bus stops that provide shelter which makes the customers happier while they are waiting and avoiding the rain. Helicopter routes are just as easy to create, but the cost of constructing a helipad and the price of the helicopters themselves make them difficult to start the game with. All helipads are created equal; none of them provide shelter for those waiting for a ride. Boat routes are pretty straight forward as well since all that you require are docks, boats and water. The water routes in Venice don’t have much wiggle room so make sure your boat lines are thoroughly planned out. Trams usually carry more passengers than buses but in order to use a tram you first have to build tracks for them to ride on. The tracks can go almost anywhere but some of the rounded corners and cul–de-sacs can be tricky. Putting in tracks costs money so make sure the routes save time and are cost effective. Finally, Metros are the most versatile since you can construct metro lines above or underground. There are three depths to work with underground to avoid any water that would get in the way. You cannot combine underground routes of various depths, however, you can merge an above ground line with an underground one. Metros are the most costly to implement but they are the most profitable since you can carry many passengers at once. The campaign mode offers various missions that will involve setting up routes to connect high traffic areas. Sometimes you are told what kind of route to setup, but most of the time you are free to choose how you want to complete the objective. Missions are given to you by the overseer and some influential customers request routes as well. Most objectives carry a cash reward once completed and some of them raise your reputation with the Transit Company’s trustees. You are given an annual report to let you know what the company and customers think of your services. This report also illustrates how many people used your transportation and how profitable you were. Other than completing your mission objectives, there is no score system or any other form of a take away from completing a scenario. You can go under financially and the city will give you two $3000.00 subsidies but after that, you\'re on your own. I don\'t think it\'s possible to lose in this game. I have walked away from my computer and was in the red for several years running and I still got decent annual reports. Normally, I haven\'t run into money issues since I hacked my gold amount with cheat engine. There is plenty of data available to find out how much coverage you are offering and what your most and least profitable vehicles are. When you set up a new stop the buildings that will be serviced by it will be in green and they fade to yellow and red if they are out of reach. The more coverage you have, the better you look to the board of directors. You can keep an eye on the vehicles used in routes to see how full or empty they are. If you notice all of your vehicles filling it, it’s time to add more to your route. You can re-arrange vehicles form slower routes to the busy ones with a couple clicks. When a vehicle is selected you can watch it making its rounds in a window on the lower right hand side. When you’re working on your lines you can make them visible or invisible if you just want to focus on a specific one. The graphics are not the best I’ve seen but they are on par with many other simulation games out there. Each vehicle model looks a little bit different. There’s a DLC available that offers new vehicles. The people wandering around aren’t incredibly detailed but you will definitely know how they feel about your service judging by the happy or sad face above their head. (I wish this option was available in real life!) Just like real cities many of the buildings look alike but there is plenty of variety with specific buildings like churches, schools, statues and amusement parks. I can’t tell how accurate the city layout is since I’ve never been to Europe. The sound effects are pretty spot on with the bus, helicopter, metro and boat noises. The background music is interesting and changes with the era and scenario you are playing in. There is no voice acting and all of the dialogue is text based. When it comes to the stability of the game I ran into a few glitches where the game stopped responding on me and I had to ctrl alt delete to close out of the program. I also had a scenario that never ended when it should have. Perhaps the latest patches address these issues. Other than that one flaw, I enjoyed playing this game and recommend it to those who like simulation games. The price is a reasonable $20 and there is a demo available if you want to give it a try before you buy it. There is no multiplayer but the sandbox and scenarios should keep you busy for hours. I can foresee some expansion packs in the future for this game.